We offer custom design work as needed. 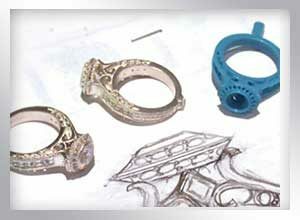 We have a highly skilled professional Jeweler that can do most Jewelry custom design. However, should you have special requests in custom design and if you want a one of a kind piece made, we can certainly have this made for you and save you on the final price! Within 3-4 weeks, we can have your piece ready, exactly to your requirements and standards. We pride ourselves on the absolutely best of quality in custom designs as well as best of prices. Come in and see our portfolio of custom designs - all now belonging to the new happy and satisfied owners!